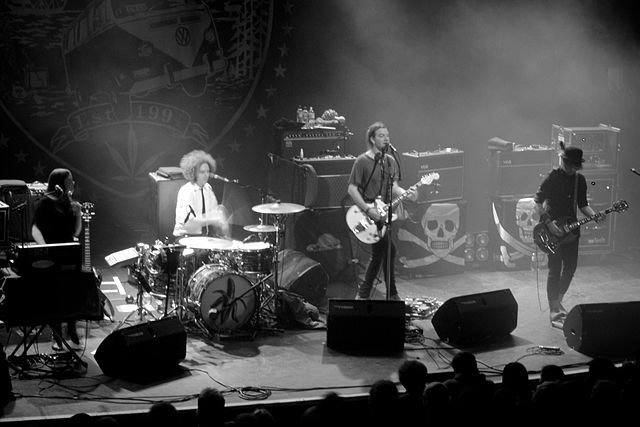 The Dandy Warhols performing in concert at the Kentish Town Forum in London, 2012. photo: Aurelien Guichard. This month there aren’t many mega-acts, neither rock, pop, or country, but what we do have are indie-poppers, some great singer-songwriters, and two guitar virtuosos. Our poppers this month include rising star Elle King, whose “Ex’s & Oh’s” saw some good chart action last year; The Dandy Warhols, who always garner a lot of radio play; a Welsh group, The Joy Formidable; and enthusiastic performers Ra Ra Riot. On the singer-songwriter front, how could you ask for anyone better than Greg Allman, who put the Allman Brothers on the shelf last year, but is still creating new music and touring. And holding her own is Jewel, a formidable singing and guitar-playing force. If it’s killer electric guitar performances you’re after, than look no further than Joe Satriani, performing at Carnegie of Homestead, and Robin Trower, who will be jamming at The Palace Theatre in Greensburg. Other highlights this month include a blues rock band from Timbuktu, Songhoy Blues; Belinda Carlisle, a former Go-Go’s member; The B-52s; the Kiefer Sutherland Band (that’s right, the actor is now a rocker); and Donna the Buffalo. A new class is being inducted into the Pittsburgh Rock ‘N Roll Legends hall of fame and there’s a big celebration for it. This month there’s more flavors than Baskin-Robbins, so head out and hear a lick or two. The boy band O-Town had as its genesis the ’00 reality TV show “Making the Band,” which aired on ABC and then MTV for three seasons. The first year, on ABC, showed the choosing and making of the band under the guidance of music producer Lou Pearlman. The following two seasons on MTV were without Pearlman and showed the band practicing, recording, and performing music on tour. Pearlman—who also organized the Backstreet Boys and ‘N Sync—was convicted in ’08 of running a Ponzi scheme and money laundering. He’s now serving a lengthy jail sentence. O-Town has overcome many obstacles to produce a nice melodic pop sound, which you can hear in tonight’s show at The Altar Bar. “Liquid Dreams,” their first single, reached No. 1 on the Billboard Singles chart, and the song “All or Nothing” reached No. 1 on the Hot 100 Chart in ’01. Jewel, one of America’s finest singer/songwriters, has—like her family—led an adventurous life. Her grandfather fled Switzerland to escape the Nazi movement, moved to the U.S. Territory of Alaska and like other homesteaders was granted 600 acres. Jewel was raised in the Alaska wilderness with no running water or heat (the family did have a coal stove to fight off the frigid Alaska weather), and would ride her horses under the midnight sun. Jewel started performing with her father as a musical duo at the tender young age of 8. She got a partial scholarship to Interlochen, a fine arts preprofessional boarding school in Michigan, where she studied operatic voice and learned to play the guitar. She raised $11,000 for the school by performing a show in a high school auditorium in her hometown of Homer, Alaska. Local businesses donated prizes to be auctioned off at the show. During spring break one year, she didn’t have anywhere to go, so she busked her way across the country by train with a guitar and a song. Then she hitchhiked to Cabo San Lucas with a large skinning knife for protection concealed in her belt. She wrote lyrics about things she saw while traveling, resulting in the song “Who Will Save Your Soul.” Jewel has maintained a semi-nomadic lifestyle (concert touring) over the years which has brought her to Pittsburgh this month.